I adore this set! Unfortunately, this striped skirt is no longer in stock. However, the exact same top and skirt are available in this pattern. 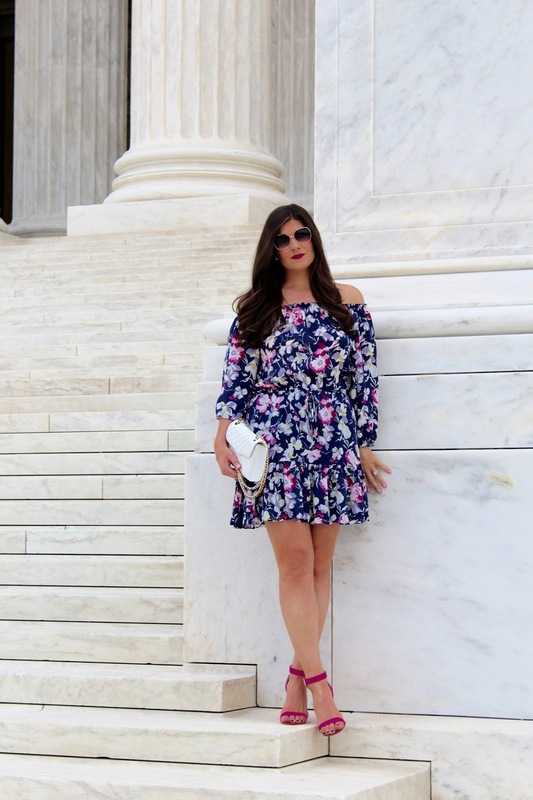 The sangria floral set currently available would be perfect for any of your last minute summer outfit needs! We are heading to Mexico for one of my best friend's weddings next week, so I still have all things summer on my mind! And, not to mention the fact that it's still close to 100 degrees outside! I hope you're having a great week. I am so looking forward to the long weekend! I can't believe we are into the final week of August! And, most importantly, only a few days away from the kickoff of college football season! I love this time of year, although spring and summer will forever be my favorite seasons. However, I am excited for a little change of pace. September is one of my favorite months in DC, so I'm going to soak up every bit of it! 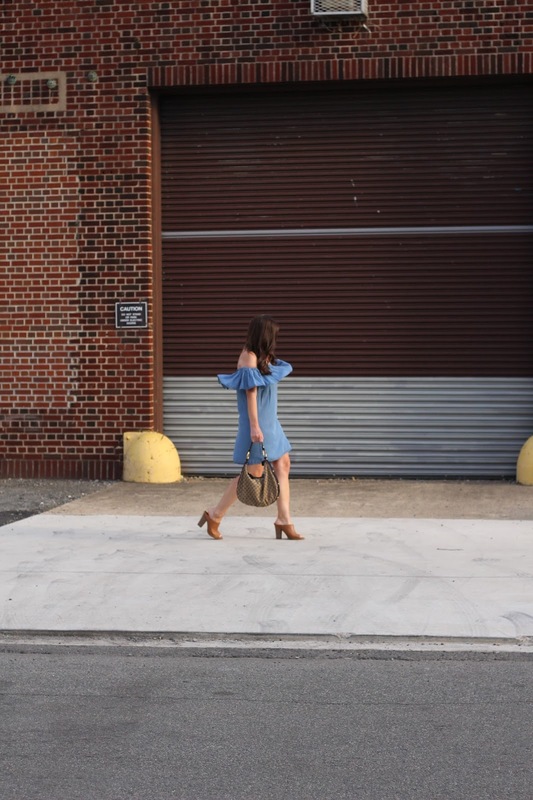 Today is all about this denim off the shoulder dress. I paired it with a belt to give it a little shape, but as you can see in the last photo, I decided to take the belt off and I ended up loving it both ways. 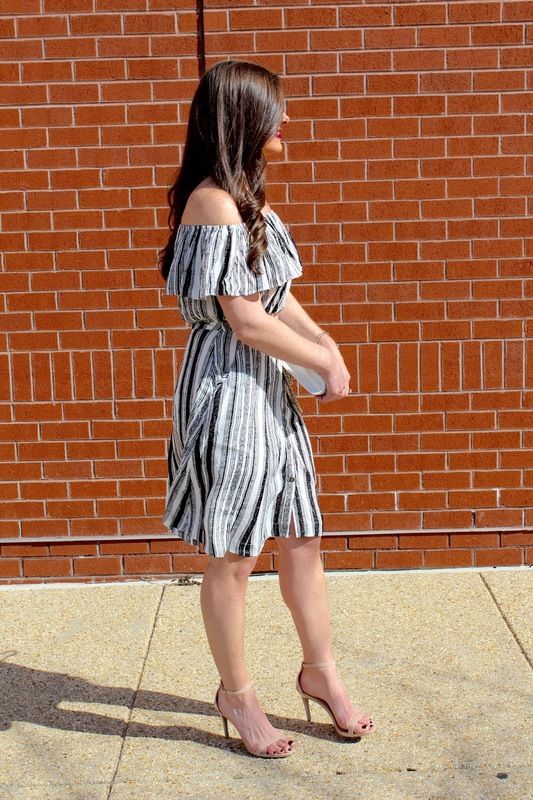 This dress is such a steal, and it would be so cute going into fall styled with these OTK boots and this Rag & Bone fedora. Below I've linked several items that would look great styled with this type of dress along with some similar denim dresses I'm loving. Wishing you a productive Monday, and I hope you have a great start to your week! Happy Friday!! Today I wanted to share these pictures from my absolute favorite restaurant we visited while in Napa. We actually visited this place three times while we were there... it's that great! The ambiance and charm of the restaurant is unbeatable. We went for dinner, for late afternoon bites and drinks on the patio, and back our final morning for some coffee and brunch drinks. Clearly, we couldn't get enough! Specifically, I really enjoyed the tater tots and the smoked shortrib quesadilla from the Social Hour Menu. When we ordered the tater tots, I thought blah sounds bland, but they were far from it! They came out served with a french onion dip, and it was truly a combo to die for. But really, put me in front of a dip, and it's gonna be gone... can I speak for all women here?! I know I can't be alone on that one! If you are ever in the Napa area, I highly recommend stopping by Archetype either for brunch, afternoon cocktails on the patio, or dinner. You can check out their full menu selection here. I hope you have a great weekend! Happy hump day, everyone! Today I wanted to share this red dress from MLM Label, which Shopbop and Revolve both carry. I have come to adore so many of their dresses and tops, and this dress is one of them. 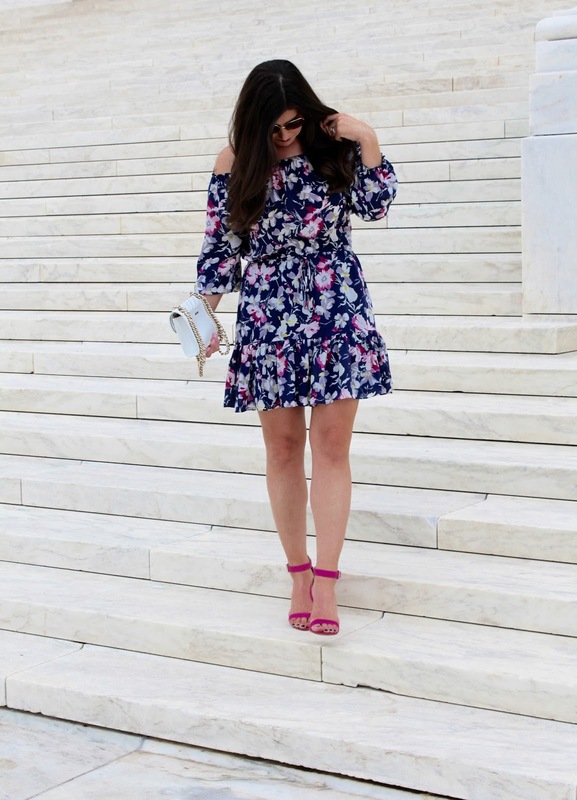 I think this dress is such a great buy, because it can be worn in the summer and definitely into the fall! I would recommend sizing down, as it's super flowy, but I also think it would look great belted. This clutch was a steal from one of my favorite boutiques located in Louisiana that I follow on Instagram. You can check them out @shopcandyapple. I love following them for some of their bright and super fun pieces. They also recently stepped up to aid the flood victims in Louisiana, which made me love them even more. I hope each of you are having a great week! Friday is almost here! Below I've linked some more MLM Label pieces that I'm loving. How is the weekend already over!? I spent this past weekend with some of my best friends from high school and college in South Carolina, and I have a feeling I might be recovering all week! It was well worth it though and so good for the soul to spend time with each of them! Onto this outfit - this past May we took a trip to San Francisco and Napa with two other couples, and these pictures were snapped in front of the cute inn we stayed at in St. Helena. It was adorable and overall one of the best trips I've ever taken. I would do it all again in a heartbeat! I wore this outfit one day for some winery tours, and I ended up loving how simple yet pulled together this combo felt. This top has been one of my best buys all summer. It is a little cropped, but not too cropped, which is what I love most about it. The lace detailing and cold shoulders turn this simple top into a statement piece. I have gotten so much wear out of it with shorts as well. I found this denim skirt at Target and scooped it up right before our trip. The fit is great, and for the price tag... I just couldn't pass it up. I was hesitant to embrace the denim skirt making a come back, so when I saw this one at Target, I thought it was the perfect opportunity to get one! And, I am so glad I did! I can't wait to wear it into fall with an oversized sweater and OTK boots. I hope y'all have a great week, and I plan to share more pictures coming up from our trip! THIS ROMPER!! I have no words... I love it so much. It is the perfect piece for this time of year, when you begin to tire of all your summer brights, but it's not quite time for everything fall yet. Living in DC, it gets cold and it gets cold fast. So, I am going to enjoy the warmer temps as long as they last and not complain one bit. Normally, I love to add a pop of color to a black and white look, but I thought these stripes were bold so I kept it simple with this Gucci mini chain bag. Lastly, I paired it all with my favorite black, block heels. The first time I wore these, they definitely hurt but after a few wears - they are so comfortable! I would definitely recommend adding a pair to your closet! Several brands make them at so many different price points (see here, here, and here). Happy Friday to you! I hope y'all have a great weekend!! One of my favorite brands has always been Joie. They are my go-to for classic, silk pieces. 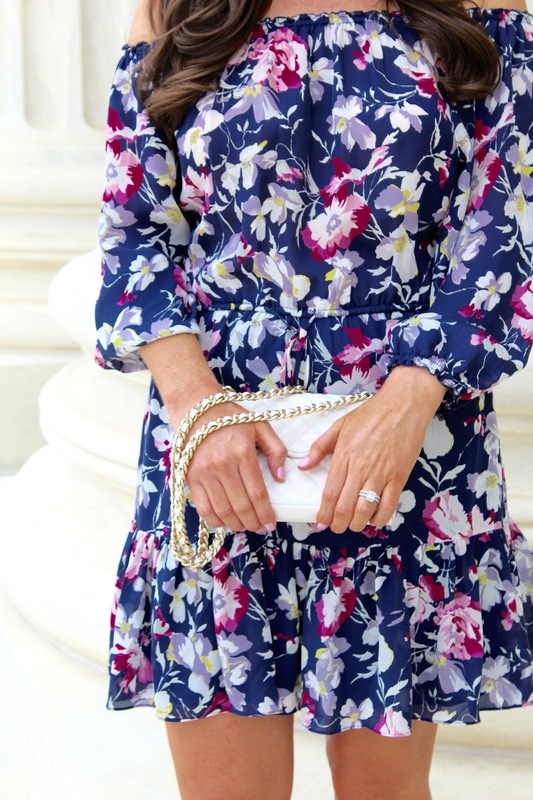 I love the feminine, floral prints they come out with each season as well as their classic, solid pieces. 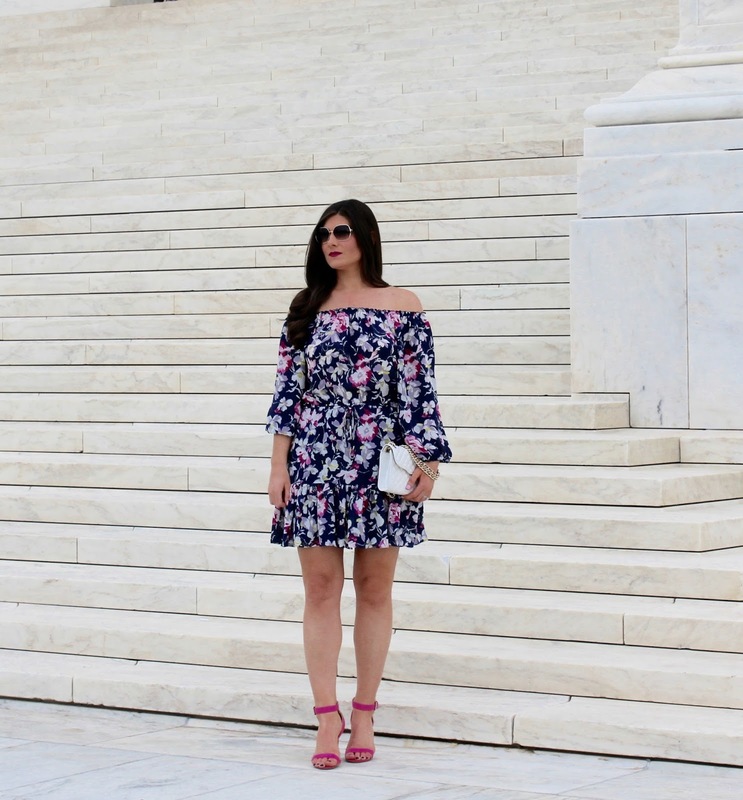 Between the off-the-shoulder neckline, cinching at the waist, and the beautiful floral print - this dress does it all! 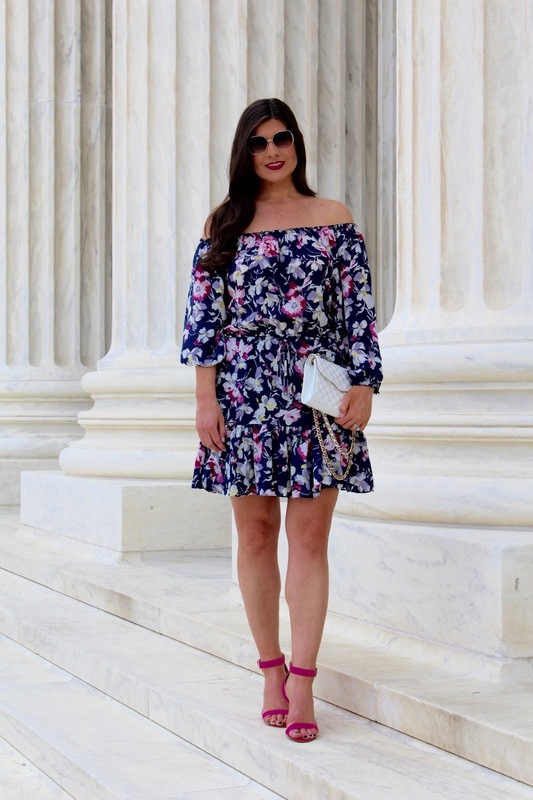 While summer may be winding down and the time for bold, floral prints is coming to an end - I will gladly welcome Joie's fall line into my wardrobe (loving this and this). And, who am I kidding ...bring on the fur! Below I've linked some of Joie's pieces I am loving for fall. I mean those OTK boots - I DIE! I hope you all had a great weekend, and that your Monday is off to a good start! I cannot believe we are already to the middle of August! 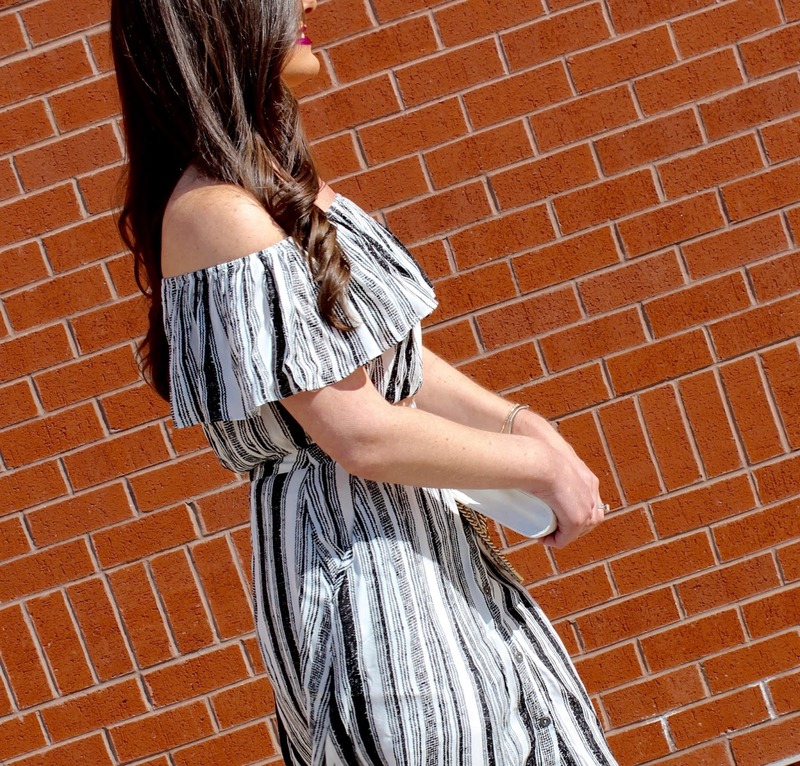 This look is all about this adorable dress from Bloomingdale's that is so very comfy, affordable, and even better... it's now on sale! My husband and I took a quick trip to New York for our anniversary weekend, and I wore this look to brunch at The Smith, which was absolutely delicious with an incredible atmosphere! I would highly recommend it! Anyways, I changed into these lace-up sandals after taking these pics, so I wouldn't slow us down while we were walking thru the city to get to brunch... comfort and food first, right? This Celine Trio was the perfect pop of color to add to this black and white ensemble, and it was such a great addition to have the entire weekend walking throughout the city. It has three different compartments (hence, the name Trio), and it stores quite a bit. I love that in one compartment I can place my full-size wallet, the other my phone, and the third I put some lipstick and whatever other beauty necessities needed for the day. Thanks for stopping by, and I hope that you have a productive Monday to start off your week! Happy Friday, friends! This top and skirt are both from Zara, and I'm not sure if there is a combo I love more than leather and lace. If you have been into a Zara recently, then you know they just had a huge summer sale, which is where I found this lace top that I can't seem to find online right now. However, they just got some great pieces in for fall, and I can't wait to style another leather and lace combo I scored at Zara this past weekend while in NYC. Each season they come out with some fabulous leather skirts, and you just can't beat the quality for the price. I am loving this leather/suede version they just came out with for fall. You just might be seeing it on here soon! Thank you so much for the support this week, as I get this blog started! I am so excited to continue sharing my passion with y'all. Have a great weekend, everyone!